Leipzig is a city in Germany located in the state of Saxony. It one of the most important tourist destinations of East Germany. The Neues Rathaus has been the seat of the Leipzig City Council since 1905. 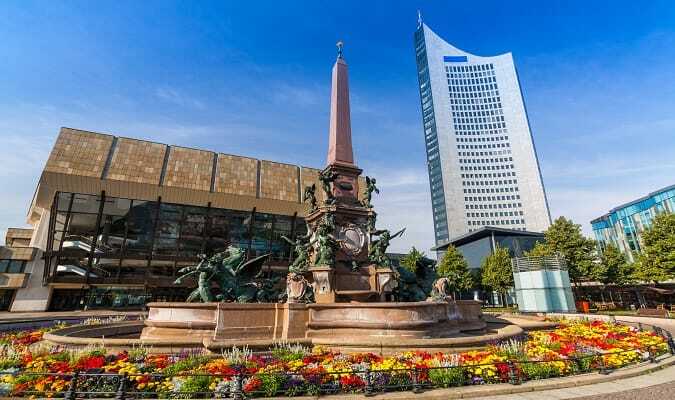 It is one of the most important landmarks of the city also the highest city hall tower in Germany. The Monument to the Battle of the Nations is one of the most important monuments in Leipzig. It was completed in 1913 commissioned to commemorate the 100th anniversary of Napoleon’s defeat at the Battle of the Nations in Leipzig in 1813. There is an observation platform at a height of 91 meters. 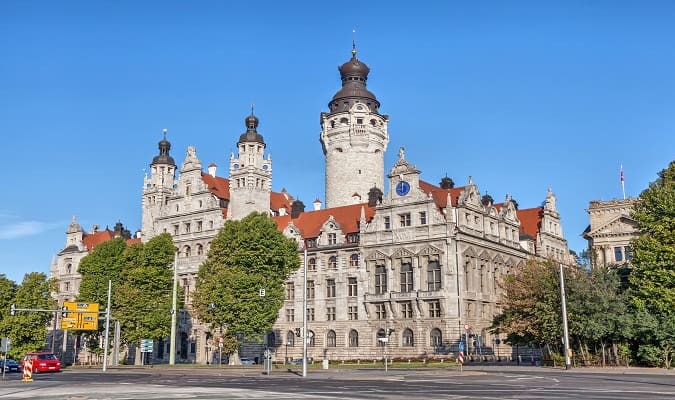 The Altes Rathaus is located in the heart of the city. It is a Renaissance building erected in 1556 that underwent many changes in the later centuries. Since 1909 it serves as the city’s history museum. 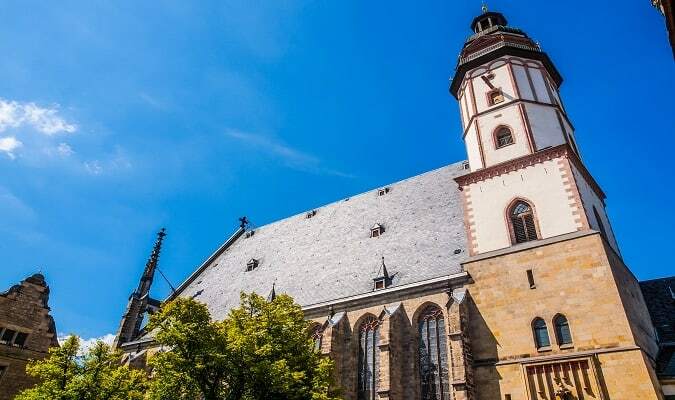 The St Thomas is a famous church for being where Johann Sebastian Bach worked as a conductor and for having his remains buried there. Another fact is that in 1539 Martin Luther preached here. The Gohliser Palace was commissioned in 1756 by the merchant and architect of the city Johann Caspar Richter. Today the palace is a venue for concerts and theater performances. The Leipzig Opera was founded in 1693, becoming the second oldest musical theater in Germany. The building is also home to one of Europe‘s largest ballet ensembles, the Leipzig Ballet. The St Nicholas is the largest church in Leipzig. It was built in the 12th century and was also graced with Bach performances. The Russian Memorial Church was erected in 1913 to commemorate the 130,000 Russian soldiers who fought for the liberation of Germany against Napoleon in the Battle of the Nations. The Augustusplatz is the largest square in Leipzig. The new campus of the University of Leipzig is located in the square. The University of Leipzig is considered one of the oldest universities in Europe and the second oldest in Germany. The Statue of Goethe is located on the Alte Börse – Naschmarkt, 280 meters from the St Nicholas. The Mercure Leipzig am Johannisplatz is located near the Central Station. The hotel has 174 rooms equipped with a flat-screen TV, minibar, work desk. The Best Western Leipzig City Center is located near the Central Station. Rooms are equipped with a TV, minibar, safe. The Marriott Leipzig is located in the heart of the city. The Mädler Passage is located 280 meters from the Thomaskirchhof. The Allee Center Leipzig was opened in 1996. It has more than 100 shops. Brands: Bonita, Adler, Camp David, New Yorker, Gina Laura, Tom Tailor. The Höfe am Brühl is located 600 meters from the Thomaskirchhof. Brands: Adidas, Pandora, Tom Tailor. Leipzig has easy train access from various cities in Germany. Famous cities nearby: Dresden, Hannover, Berlin.